LoDo Cares is a co-creation by two community associations in the neighborhood: LoDo District, Inc. focusing on businesses (www.lodo.org), LoDoNA, focusing on residents (www.lodona.org). 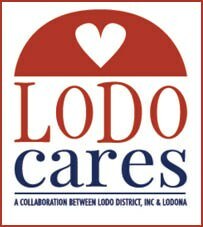 LoDo Cares sponsors and coordinates philanthropic initiatives in the neighborhood. 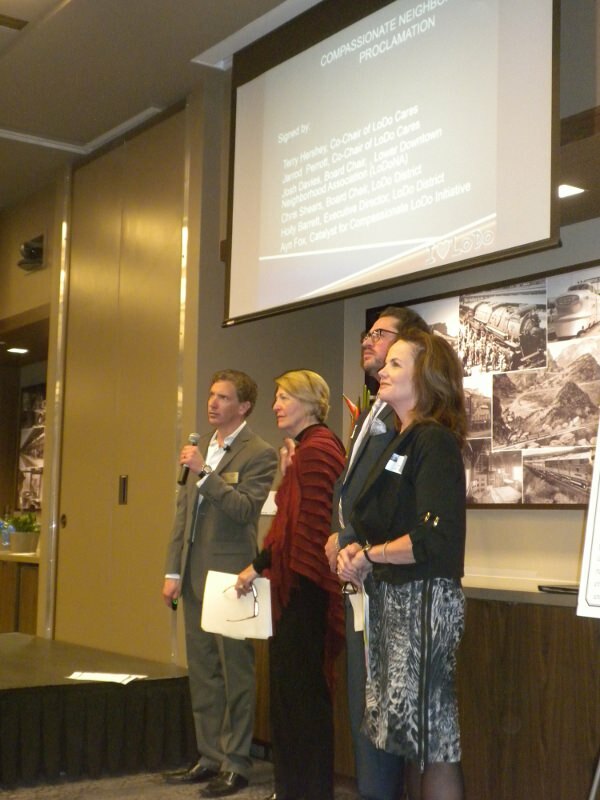 As a result of the commitment of LoDo Cares to provide compassionate acts in our community, LoDo was recognized as the first Compassionate NEIGHBORHOOD*, in the Compassionate City Campaign at the LoDoNA Annual Meeting on February, 27th, 2014. The Proclamation was read out loud by key leaders, and the audience had the opportunity to read and sign the Charter for Compassion. 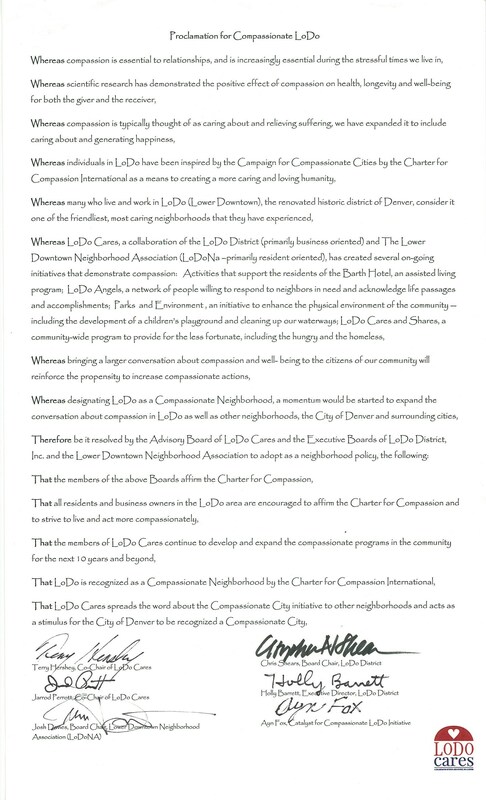 * Perhaps this was one of the reasons the Charter's campaign was renamed to Compassionate Community..
At that event, LoDoNA initiated their first COMPASSIONATE NEIGHBOR AWARD. 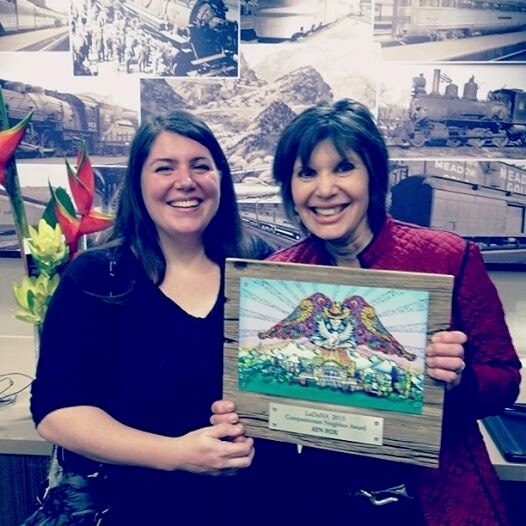 It was awarded to Ayn Fox, the individual who was the champion for LoDo to be recognized as a Compassionate Neighborhood. 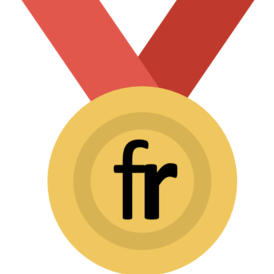 As a surprise, the organization contracted with Ayn's daughter, ED Hose- an award winning artist, to create a most unique and fun award. To date it has been presented to three other compassionate neighbors. THE BARTH HOTEL: (a non-profit assisted living residence for people on social security disability). The neighbors create celebrations and special events for the residents. THE HOLIDAY PROJECT: We raise money during the winter holiday season to support organizations in need. In the past, we often provided in-kind donations such as food, personal care products, back packs - though we learned that the organizations could better use the money to purchase items in bulk. Recently, we have been using the money to supplement the kitchen at the Barth Hotel. LoDo ANGELS : Neighbors stepping up to help neighbors in need. Initially over 80 people stepped up to be angels. We then discovered that people were hesitant to ask for help. We are presently looking to see how we can best be of support to people who are living without homes. CREEK and PLAYGROUND CLEAN-UP. Individuals and groups gather at designated times to clean up debris around the creek and maintain the gardens around the playground. The development of the playground was an initiative of LoDo Cares. At the end of each meeting, we have a Compassion Report - where committee members note examples of where they have seen compassion given or needed. This is also an opportunity to share poems, insights, quotes, and events having to do with compassion. Visit Lodo Care's Facebook Page to see updated images and information regarding on-going compassionate initiatives!